I've started to bake since the day I move and got married. It's quite challenging, especially learning about how to use the proper measurement of different ingredients instead of using the estimation, which by the way very common in the Philippines. I have the opportunity to work on this product on Sethji Global, of their Cake Ez Decoration 140pcs set. The Brand new cake decorating 140pcs set including piping bags. 1 Cake decorating pen - Now you can also do those fine lines with this easy to use the cake decorating pen. A 30 stainless steel decorating tips, 3 couplers & 1 flower nail, clear lid case for easy tips storage. And 100 large 13inch disposable icing bags and 4 small bags, are all in the package. I didn't see any signs of damage in the shipment that I was able to use and check the product right away. I should've used a white frosting but it was too late.. 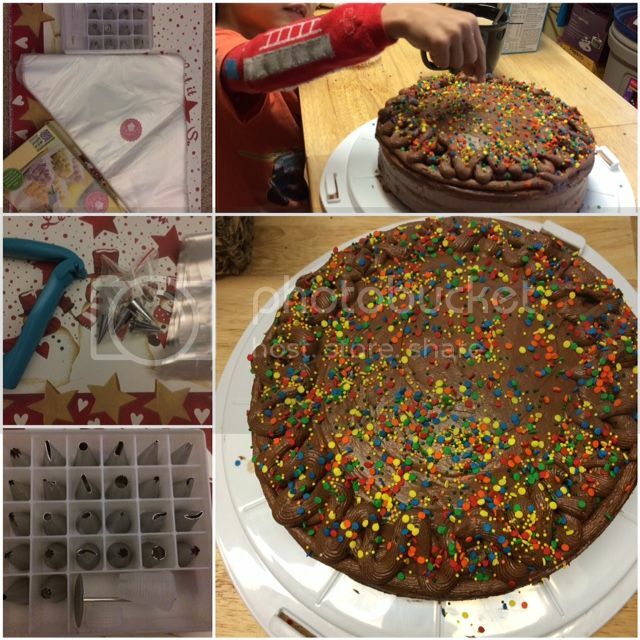 The product is very easy to use, the set is amazing because everything is there you can choose what tips you want to use to decorate cakes or mini cupcakes. It is also easy to clean. When I used one or two of the tips, it is very convenient to use it. The outcome of the design in your frosting to the cake is wonderful. I have no knowledge of decorating a cake, but it was fun learning the easiest way of course, through the help of the different decorating tips this product can provide me. You can purchase the item here. This would be a great Holiday gift to someone you knew who bakes. This is NOT a sponsored post, I did not receive any financial amount. I received the products in a heavily discounted price in exchange of my honesty review. The outlook I expressed is 100% exclusively mine. How nice, perfect for people who love to bake jus like you do. That's a really lovely gift especially for people who are just beginning to learn how to bake! So awesome! This product looks fun while baking with your family. Who doesn't like cake? I know I like eating cake. I'd love to have a set myself. Although I am not really good with baking, but I guess I would be inspired if I had a great decorating set like that. I am now craving for a choco moist cake now. Your family is soon lucky to have a baking-loving mom.